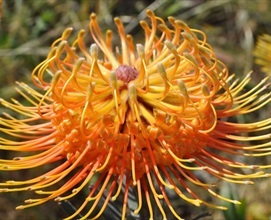 The latin named Leucospermum are long lasting flowers of the Proteaceae family available in tones of red, orange and yellow. 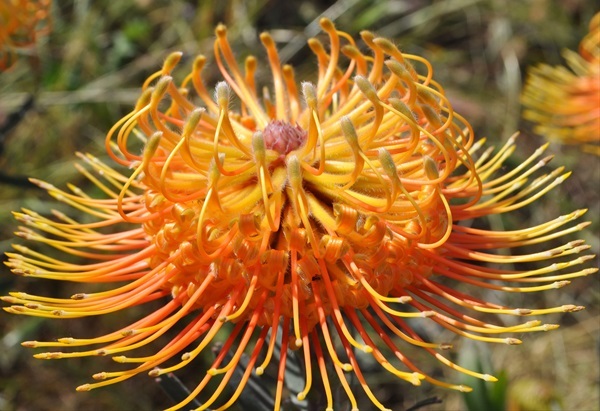 Pincushions are a spring flowering plant and are available from February to June from California and from August to October from South Africa and Australia. New hybrid varieties boast larger heads, more vibrant colour and longer vase life. Pincushions dehydrate easily but bounce back quickly when re cut and hydrated with floral preservative. Cut and hydrate in floral preservative outside of the cooler for 2 hours. Tighter cut Pincushions can look deformed but will open well in 2 to 3 days. Pincushions are graded by head size as well as stem length. Florist quality pincushions should have a minimum 40 to 50cm stem length and can be as tall as 70cm. Cut stage should be about 60-75% open to ensure full formation of bloom upon hydration. Smaller florist sized packs of 40 to 50 stems are increasingly popular. Care must be taken while packing to ensure heads do not break in transit.